Hair loss is a common complaint, more so in men than women. Everyone sheds about 100 hairs each day as part of the normal hair growth cycle, but excess loss is usually a distressing development. Most people’s hair grows about a half-inch per month, and about 90 percent of your hair is actively growing at any given time, with the other 10 percent in dormant phase. After two or three months, this dormant hair falls out and its follicles begin growing new hair as other follicles begin a dormant phase. Alopecia, the medical term for hair loss, doesn’t only happen on the scalp. Some illnesses and medications can trigger balding over the entire body, though genetics account for 95 percent of all cases on the head, according to the Cleveland Clinic. Harsh hairstyles or treatments: Hairstyles that consistently use rubber bands, rollers or barrettes, or pull hair into tight styles such as cornrows, can inflame and scar hair follicles. So can incorrectly-used chemical products such as dyes, bleaches, straighteners or permanent wave solutions. Depending on the degree of damage, resulting hair loss can be permanent. Hormone imbalances: In women, hormonal shifts from birth control pills, pregnancy, childbirth, menopause or hysterectomy can induce more hair follicles than normal to enter the dormant phase. Illness or surgery: The stress from sickness or surgery may prompt the body to temporarily cease nonessential tasks such as hair production. Specific conditions can also trigger it, including thyroid disorders, syphilis, iron deficiency, lupus or severe infection. An autoimmune condition called alopecia areata, which has no cure, causes rapid body-wide hair loss. Medications and vitamins: Cancer chemotherapy, which attacks hair follicles in its attempt to kill all fast-growing cells around the body, is a well-known reason for hair loss. Other medications’ side effects include hair shedding as well, such as some that treat high blood pressure and gout. Nutritional deficits: Heavy dieting or eating disorders such as bulimia and anorexia can temporarily stun hair follicles to cease growth. This can also occur from insufficient protein, vitamin or mineral intake. Aging: A natural effect of growing older is slowed hair growth. Some of these problems need medical attention, in the form of medication or special vitamin cures. For people whose problem does not need medication and who don’t want to resort to surgical solutions or wigs and toupees, there are natural hair restoration products. Many of these are plain hoaxes, but a number of hair restoration products have been scientifically tested and their effectiveness is clear. 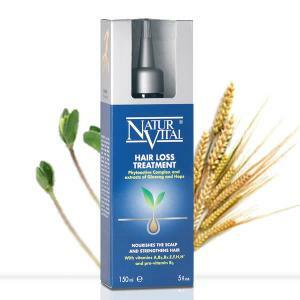 One of these hair restoration products are created by the Natur-Vital company from Spain. Results of using hair restoration products are not instant. It takes at least 3 – 6 months of regular use, but the results are there. Continuous use of these hair restoration products can only re-inforce their results. An alternative solution, albeit temporary, is the use of hair loss concealers, such as Boom Boom Hair. This is a powder made of protein filaments which adhere to existing fine hairs and give the appearance of a full head of hair. Hair loss concealers are very popular with Hollywood celebrity stylists, some of whose clients are in need of hair loss concealers.